Founded in 1906 by three brothers bearing that name, initially they repaired bicycles. This was followed by the production of motorbikes (starting in 1908) and then cars, the first prototype, a very small two-seater with a 350cc two-cylinder engine, also emerging in 1908. This entered production a couple of years later as the 8-10HP with a 800cc engine (still V2 air-cooled) and production continued through and after the first world war. Over 1500 examples were built until around 1924. After the end of the war another model was produced, in collaboration with other companies who produced the engine, body (stabilimenti Farina), and mechanical parts as well as the assembly process. Two models were available, the normal version (two-cylinder air-cooled 1010cc Vee engine with 20bhp) and a Sport model (two-cylinder in-line 1021cc with 25bhp). Various body styles such as torpedo, spyder and van were available. The company changed its name to 'Societa Anonima Vetturette Temperino' in 1919 and its continuing success (helped also by publicity from success in motorsport) led to the establishment in 1922 of Temperino Motors Ltd, based in London and responsible for the licence production and sales of the cars in that market. Also in 1922 there arrived a new car, the GSM 7-14HP. 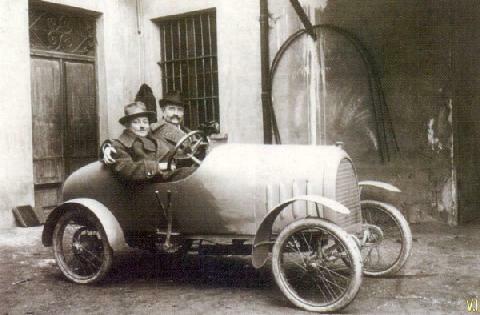 Despite the cars being exported from South America to Russia, Temperino could not survive the economic problems of the early 1920's, and in 1925 ceased producing cars. The UK company continued until 1940. The family continued to develop and produce parts for production cars, mainly Fiats, for some years afterwards.